Are you happy with your cabinets but want a new countertop to spice things up? Casey's Creative Kitchens has you covered! We have our own in-house fabrication shop where we fabricate and install all types of stone including granite, quartz and marble. From countertops to fireplace surrounds we have the latest in machines and technology to provide you with that WOW factor you are looking for. And here's the best part - you don't have to deal with a middle-man! You receive the same Casey's professional design and service all the way through. We take care of you from start to finish. We consult with our kitchen designers on our selection of slabs to ensure that we are keeping pace with up and coming trends in cabinet design. 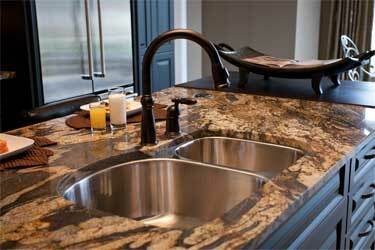 We also carry all of the most popular brand names in the countertop industry. We have kitchen accessories like sinks, faucets, pull-outs and more! Casey's Creative Kitchens is a one-stop shop for all your kitchen needs. Book your free consultation today or come a visit our countertop shop and see for yourself! Our shop is located at 4169 Perkins Road across from our London showroom.